Was that a coyote or a fox that walked through here? Take the guesswork out of identifying North American animal tracks. 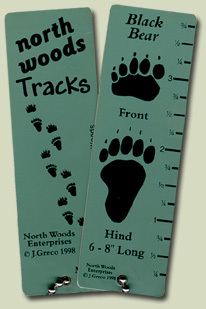 The North Woods Tracks Guide features 22 different animal tracks commonly found in North America. Each of the tags, measuring just 1¼” x 4”, are bound together on a ball chain and fan out easily for quick comparison. The side of each tag is equipped with a ruler to aid in identifying the size of the track – an important step in determining the difference between some animals, such as a fox and a coyote. Interesting facts about where the animals live, what they eat, and how big they grow are found on the reverse side of each tag. Click on the name of the animal for more specific information.